Research commissioned by a group of British, backbench, Tory MPs conclude, that European judges have ruled more than 270 cases taken against Britain, has “breached a Convention right”. The final report, written by Robert Broadhurst, a legal researcher, found that since Britain signed up to the European Court of Human Right’s jurisdiction in 1966, there are more than 350 rulings on UK violation of human rights.The number of judgments made against the UK violating human rights stands at 271, against only 86 ruling otherwise”. Sir Nicolas Bratza QC, the President of Strasbourg-based European court, in response to repeated attacks from the British Prime Minister David Cameron, against the Human Rights Court, he accused “senior British politicians” of failing to understand the European Courts role and history. Writing "Britain should be defending European justice, not attacking it", he said: "The UK can be proud of its real contribution to this unique system and its influence in bringing about effective human rights protection throughout the European continent. It would be deeply regrettable if it were to allow its commitment to that system to be called into question by a failure to defend it against its detractors or to offer its strong support for the vital work of the court." The European court has 47 judges, representing each member state of the Council of Europe. Research shows that Britain has a horrific record of human rights abuse, losing three out of four cases taken to the court against it, which was established in the wake of the Second World War. The British tactical response is to dismantle the power of the courts, in the same manner, that its is currently systematically dismantling the Irish Peace Process. There have been many rulings against Britain in the European Court of Human Rights with regard to Irish people. In the early 1970's, when the British once again introduced internment without trial, Britain was found guilty by the European Court of Human Rights.The Irish Government, on behalf of the hooded political internees, who had been subject to the five methods used later in Abu Graib, took a case to the European Commission on Human Rights . The Commission stated that it "considered the combined use of the five methods to amount to torture, when Martin Corey and fellow political internees were battered and tortured, by he British at that time. The relatives of three Irish people, Danny McCann, Sean Savage and Mairead Farrell, murdered by the British SAS in Gibraltar, were so disgusted at the response of the British legal system, that they took their case to the European Court of Human Rights in 1995. The court found that the three had been unlawfully killed, ruling that the human rights of the 'Gibraltar Three' were infringed by Britain, in breach of Article 2 - right to life when Britain's SAS, shot dead the clearly unarmed volunteers, execution style, at close range, on explicit orders, of Margaret Thatcher and senior members of the British Tory Cabinet. Now according to the BBC, lawyers are to challenge the internment without trial of of an Irish republican from Lurgan, County Armagh, in the European court. Martin Corey, who is a 63 year old man, has been politically interned without trial for over three years, without any charges being brought against him. Martin was released in 1992, prior to the Irish Peace Process, after serving almost twenty years in Long Kesh Concentration Camp in British Occupied Ireland. Over three years ago, Martin a member of Republican Sinn Fein, a legal political party, was politically interned, with his legal team not beingtold why he is considered to be a risk, so his lawyers are now taking the case to the European Court. According to a BBC interview with his lawyer, Peter Murphy, has said Martin was being denied the right to a fair trial. "It's like internment all over again in the sense that he hasn't been given the chance to defend his position," Mr Murphy said. When we ask questions about the nature of the allegations and evidence against our client we are told nothing. In any criminal court you can meet your accuser, you have a chance to cross-examine them, and you have a chance to defend yourself because you're given the detail of what the allegations are against you.We don't have any of that, so our client is in a very difficult situation in that he's sitting in prison not knowing why he's there." A judge, who is one of the few remaining experts on European Law in British Occupied Ireland, after the British Government have assassinated all other lawyers who were European Law experts, ordered the immediate release of Martin, on the grounds that his Human Rights under European Law were being ignored and abused by the British. However when Martin was taken to the front gate to be released and about to embrace his family, another dictatorial order, from the unelected, English Viceroyal, who is the de facto overlord of the British colony, overruling all courts and parliament with imperial internment without trial. 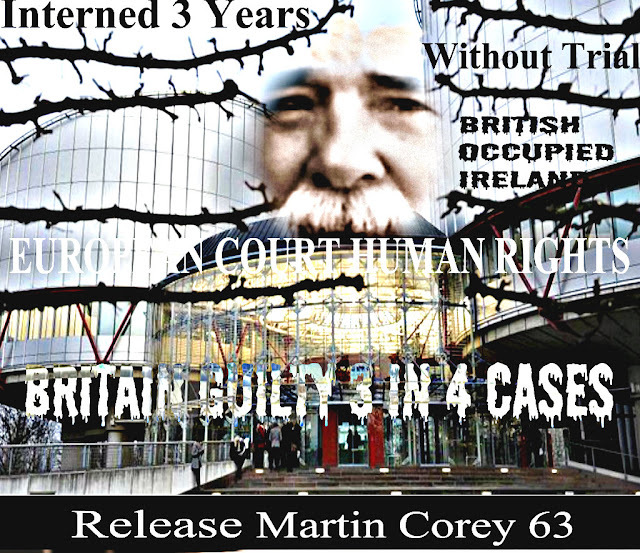 The European Court of Human Right’s is the last chance, of 63 years old Martin Corey ever experiencing a limited freedom in British Occupied Ireland ever again.